Is there too much middle class welfare in Australia? 'Middle class welfare' has recently reemerged as an issue in Australian politics, primarily as a result of debates about how the Australian Government should fund infrastructure reconstruction following the floods in Queensland and Victoria. 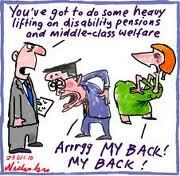 Criticisms of middle class welfare are often premised on the idea that it is a particular problem in Australia. But what is the extent of middle class welfare in Australia and should access by people on middle incomes to welfare benefits and services necessarily be seen as a matter for concern? First of all, it needs to be pointed out that Australia's social welfare arrangements are quite different from those of most overseas countries. For example, income support to people such as the old, those with a disability, the unemployed and those caring for children is provided on a flat rate basis and funded from general taxation, rather than personal contributions made by people during their working life (social insurance). This differs from most other welfare states, whereby, such people are supported through earnings related income replacement schemes. Consequently, Australian welfare benefits are generally lower than in other welfare states. Most importantly, though, the Australian income support system is unique for the extent to which its social welfare programs are means tested. As a result, middle class welfare in Australia is low when compared with other developed countries. This point was illustrated in a recent article in the Australian Economic Review by Peter Whiteford of the Social Policy Research Centre, University of New South Wales ('The Henry Review and the Social Security System'). He suggests that as a consequence of its design features, 'Australia has less `middle class welfare' than any other developed country, and Australia has the most `target efficient' system of cash transfers in terms of inequality reduction of any OECD country'. however, Australia spent more than 6 per cent of GDP on income-tested programs, close to 80 per cent of its total spending on cash benefits--this is more than four times the OECD average, and five times the level in the United States, for example, despite the similarity in total spending. Comparing the share of transfers received by the poorest population quintile to the share received by the richest quintile, it can be calculated that in 2005, the average OECD value was 2.1, but the Australian ratio was 12.4; that is, the poorest 20 per cent of the population receive more than 12 times as much in social security benefits as the richest quintile. None of this is to say that there are not particular areas in which welfare payments could be better targeted. Nevertheless, it does challenge perceptions that middle class welfare is a particular 'problem' in Australia (or, as is sometimes suggested, 'out of control'). how might the income protection system be designed in such a way as to better promote the Government's social inclusion objectives such as increasing access by disadvantaged people to market income (and social participation, more generally)? what meaningful policy options (in addition to changes to the income support system) exist for assisting the long-term unemployed and people with disabilities to find employment? is investment by Australian governments in community services, health and education adequate (and adequately targeted) to promote social inclusion and prevent the emergence of social problems. While the above suggests that the extent of middle class welfare in Australia may be overstated, a further question is whether access to welfare benefits and services by people on middle incomes should be regarded as inherently a matter of concern. Criticisms of middle class welfare tend to raise two main objections. First, there is the concern that such expenditure is wasteful and diverts money that might more fruitfully be spent in other areas. Second, there is the moral objection to providing welfare to 'people who do not need it'. Each of these objections is essentially based on the idea that the purpose of welfare is to redistribute income between rich and poor (sometimes known as the 'Robin Hood' approach). However, as I highlighted in a Parliamentary Library paper in 2008, there are other views about the purposes of welfare. The primary objective of most other welfare states is what is known as the 'piggy bank' objective. This is the idea that all individuals (not just the poor), either through taxation or participation in social insurance, effectively ‘save’ throughout their lives in order to ensure they are protected against the various risks to their incomes that occur throughout the life course. Some supporters of this approach see it primarily as an expression of social solidarity and hence necessary for social cohesion and stability. Others highlight the contribution to other goals such as workforce participation and sustained economic growth. Australia's system is primarily based around pursuing the objective of redistribution. However, it also has some elements that are consistent with the piggy bank approach such as the system of family payments and paid parental leave. Further, Australia's non-means tested national health insurance scheme, Medicare, can be seen as pursuing the piggy bank approach. As I suggested in the Parliamentary Library paper, the most appropriate measure of effectiveness of the piggy bank approach 'is less likely to be about poverty and inequality than it is about more complex/rich indicators such as willingness to take risks, capacity to manage social transitions or development of a range of individual capabilities'. According to one proponent of this approach, John Quiggin, these functions of the welfare state are ‘just as relevant, (perhaps more so) for those on middle incomes as for those lower down the scale’. Consequently, to the extent that targeting according to means is regarded as a/the appropriate means for addressing poverty, it is far less relevant when welfare is viewed in terms of the piggy bank objective. Indeed, it may be that, as a result of negative incentive effects associated with means testing (high effective marginal tax rates, poverty traps and other unintended consequences), targeting according to income is likely to have negative effects on people’s capacity to manage risks and transitions and develop their capabilities. The point of this is not to suggest that one approach (Robin Hood or piggy bank) is preferable to the other but to highlight the importance of being clear about the objectives of a particular welfare benefit or service (and indeed the welfare system overall) in the debate about middle class welfare.